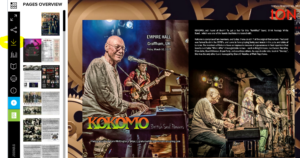 Thanks to Graham Whittington, Kokomo is featured in the May 2017 edition of Ion Magazine. You can view the magazine here. Don’t be alarmed if you’re asked to enable ‘Flash’. When you get to the screen on the right, click the download icon that is highlighted in yellow. This will download a PDF version for you. Jump to page 61 and you’ll see plenty of Kokomo pics. ION Indie Magazine describes itself as follows..